The district headquarter of Lakhimpur has been gasping in congestion with increased number of vehicles and equally very poor traffic management by the police in recent times. 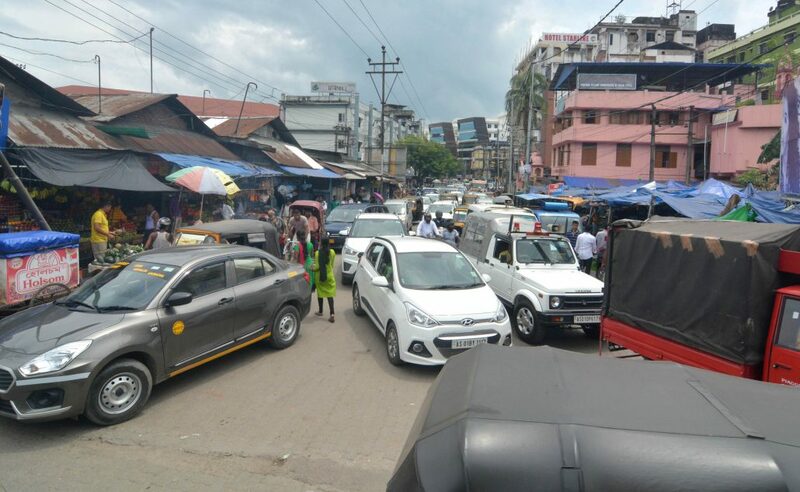 The town of North Lakhimpur, which has very limited number of link roads, is overcrowded with increasing number of vehicles everyday making it very difficult for commuters in their day to day movements. The latest menace of the traffic woes the town is the uncontrolled entry of e-rickshaws swarming all the limited and narrow roads of the town and its daily ordeals with common public and traffic police. E-rickshaws were introduced in North Lakhimpur two years ago with licensing from District Transport Office, Lakhimpur. There are 350 licensed and registered e-rickshaws for the urban area in North Lakhimpur and 190 incensed and registered ones for the rural areas. However, more than thousand vehicles of this type are running in North Lakhimpur, most of them illegally without the license and registration from the DTO, Lakhimpur, locals alleged. The Lakhimpur DTO has not issued any registration for e-rickshaws since October, 2017. Locals said that the increased e-rickshaws are the addition to the already overburdened roads of North Lakhimpur with no proper traffic control system. Stands of private buses, mini services, three wheelers and other commercial vehicles have been given a free hand by municipal authority and traffic police at every place of all roads of the town, said a local. This parking and stands of private transport are allowed and facilitated after every two hundred meters of all the roads in the town making other vehicles and pedestrians very difficult to move on. Two wheelers are also allowed to enter through the roads marked with ‘No-Entry’ for one-way traffic. Similarly heavy commercial vehicles, which are not allowed to pass the North Lakhimpur town through the NH-15 at day time, are allowed to move immediately after 8 pm when the town still remains filled with normal traffic which create chaos every night. In addition to this increased number of stray cattle are creating troubles in public roads of the town in every area. The citizens of North Lakhimpur are suffering from these problems which are the result of unplanned urbanization and flawed town planning by the municipality, lack of parallel and alternative roads and a very complicit role by the traffic police. The issue of e-rickshaw also has a social problem as many unemployed youths are running these for livelihood with bank loans. As the regulation of e-rickshaws are implemented by the concerned department there is no control over the sale of the vehicle as lots of outlets are selling them in North Lakhimpur.